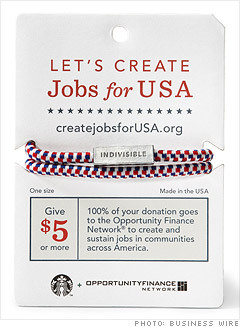 Starbucks has raised more than $7 million by selling 'Create Jobs' wristbands. The company expects the program to create 2,300 jobs as the money makes its way to small businesses and nonprofits. Starbucks has distributed more than 500,000 red, white and blue wristbands in the last three months, and, no, it's not just because the coffee giant is feeling patriotic. The wristbands, sold for $5 each, are intended to fund loans to small businesses, nonprofits and other organizations that will create American jobs. New figures released by the company on Thursday, show the ongoing Create Jobs for USA program has so far raised more than $2 million. Coupled with $5 million in seed money already donated by Starbucks, the company expects the program to create at least 2,300 jobs. That said, the money takes time to trickle down to business owners and heads of nonprofits. To get from the Starbucks cash register to a small business or agency, the donations first pass through the Opportunity Finance Network, which then gives grants to community development financial institutions, or CDFIs. Those lenders are tasked with doling out low-interest loans to small businesses and nonprofits in need. So far, 278 loans have been made in 31 states across the country. CNNMoney tracked down five small businesses and organizations that are already putting the funding to use. The Gelato Fiasco got a loan funded by a Starbucks campaign to open up shop down the block.